Professor Ansari has published in several leading academic journals including Academy of Management Journal, Academy of Management Review, Strategic Management Journal, Organization Science, Journal of Management Studies, Strategic Organization,Research Policy, Industrial and Corporate Change and Organization Studies. He serves on the editorial boards of Academy of Management Review, Organization Science, Journal of Management Studies and Organization Studies, and is a high performing member of the Erasmus Research Institute of Management (ERIM) at Erasmus University in Rotterdam, the Netherlands. He is also a consultant at Thinfilms Inc., a New Jersey firm providing thin film services (in particular coating services) to over 150 corporations in the hybrid microelectronics, semiconductor, optical, medical and sensor industries. Professor Ansari’s areas of expertise in executive education include strategic management, technological and business model innovation, social innovation, and corporate social responsibility. He has contributed to executive education programs in many organisations, including McKinsey, Airbus. Shell, British Telecom, China Development Bank, Nokia, Laing O’Rourke, UNICEF, Essex County Council, City & Guilds, KLEC (Kuala Lumpur Education City), Shanghai University of Finance and Education among several others. He is frequently invited to speak on issues related to strategy, innovation and social change. 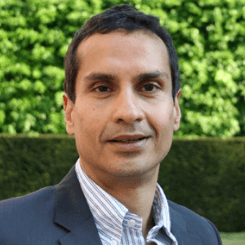 Professor Ansari is a member of the Cambridge Corporate Governance Network (CCGN).